With injuries mounting and SIX teams on bye again in Week 9, my suggestions this week will go a bit deeper and may be more matchup focused as the viable IDP waiver wire options are going to be less prominent than in previous weeks. Michael Bennett will miss two to three weeks after undergoing arthroscopic knee surgery. Second year player Frank Clark will slide into Bennett's starting role. Chargers rookie standout Jatavis Brown hurt his knee last week. Although not season-ending, he is expected to miss a couple weeks. With the Chargers having a Week 11 bye, I wouldn't be surprised if he's out until Week 12. Teammate Denzel Perryman also left the game with a hamstring injury and did not return. His Week 9 status is more unclear, however. Looking at the Wednesday-Friday practice reports should give us a better sense of his availability for this week's game. After being listed as questionable on Friday, Broncos linebacker Brandon Marshall was inactive on Sunday. Corey Nelson filled in on an every down capacity for him but isn't worth much of a look on waiver wires. NFL sack leader Lorenzo Alexander exited Sunday's contest against the Bills early with a hamstring injury. He did not return. Alexander said he's suffered this same type of injury previously and was able to play the following week. The Bills play on Monday night, so he will have an extra day of rest which may further help his chances. We should know more on his status later in the week. Veteran safety Mike Adams suffered what was reported to be a "nasty" groin injury and is expected to miss a decent chunk of time. DB2+/DB1- Barry Church broke his forearm is Sunday Night's game against is projected to be out 3-5 weeks. J.J. Wilcox will take over his spot in the interim, but I wouldn't expect him to come near to Church's level of production based on his historical tackle rates. Corner/safety Tyrann Mathieu suffered a shoulder injury and will miss the next three to six weeks. This is a critical blow for a Cardinals team that heavily relies on the play of it's secondary players. 2015 stud Ezekiel Ansah has had rotten first half of the 2016 season. He has just six total tackles through five games - that's it. He missed three weeks due to injury but has compiled just four tackles since he return in Week 6. His snap count was almost back to normal last week so it doesn't appear to be a playing time issue. Rather, I think his injury is likely still bothering him. At this point, I'd bench Ansah until he starts producing. For those in shallow leagues, I think you have to think about dropping him if there are solid options on your waiver wire. Owners that practiced patience with Kahlil Mack are being rewarded as he exploded for a 6-1-2 FF stat line in Week 8 and has had at least one sack in four of his last five games. Continue to ride the third year stud out of Buffalo. Lavonte David continues to put up relatively pedestrian numbers for a player who has been one of fantasy football's top producers in each of the last four years. The Bucs seem to be using him more in pass coverage and as an edge setter which is negatively affecting his tackle production. This said, he should be looked at as a LB2-/LB3+ until that role changes. Kwon Alexander, on the other hand, should continue to rack up tackles at a torrid pace. After missing the first 7 weeks of the season due to injury, Dannell Ellerbe finally made his return to the field last week. He split time with Nate Stupar however which left Craig Robertson as the team's only every down linebacker. As of right now, Robertson is the only Saints linebacker worth owning. With both Darron Lee and Bruce Carter inactive last week, undrafted free agent Julian Stanford played every down at ILB next to veteran David Harris. Look for him to continue in that capacity if Lee and Carter remain out. DE Frank Clark (SEA) - Clark has blossomed in his second year with 5.5 sacks through seven games. With Michael Bennett sidelined for a couple weeks, the former Wolverine will be receiving a full complement of snaps. He has a decent matchup against the Bills this week and has a good chance to extend his sack streak to three consecutive games. DT Marcell Dareus (BUF) - Dareus has been a consistent low-end DL2 throughout his five your career. He's widely available for pickup after missing the season's first seven games due to suspension/injury. In his first game back last week, he received a larger than expected amount of snaps and came through with an impressive 4-0-1 stat line. He faces off against one of the worst offensive lines in the league this week in Seattle and makes for a very solid Week 9 pickup. DE Mike Daniels (GB) - Daniels has been one of the better interior defensive lineman in the NFL this season and is a big reason why the Packers are one of the league's best run defenses. However, that great play hasn't translated to much in the box scores as he's registered just two sacks and 11 tackles through seven games. The good news is the Colts are on the schedule next who lead the league in sacks allowed with 31 in eight games (nearly four a game). Given there are six teams on bye and a lot of DE "studs" haven't been producing, Daniels is worth a flier in a lot of leagues as a DL3 this week. LB Kiko Alonso (MIA) - Alonso is likely owned in a lot of leagues but may have been dropped due to his bye last week. With Reshad Jones out for the year, he has perhaps the least amount of tackle competition in the league and has a fantastic tackle matchup in the Jets this week (see last week's column for a breakdown of the massive amount of tackles given up to linebackers by the Jets). I'm projecting him as a fairly easy bet for double digit total tackles this week. LB Dont'a Hightower/Elandon Roberts (NEP) - The surprising trade of Jamie Collins to Cleveland means that Dont'a Hightower will slide into an every down role. Hightower has shown flashes of elite upside in the past but consistency issues and varied playing time have largely relegated him into the LB4+ tier. Although I still have my concerns that he can produce at a high level week in and week out, he has the tools and now opportunity to be a LB2+. He's on bye this week but should be one of your top waiver wire pickups based on potential rest of season production. Elandon Roberts has the potential to outproduce Hightower; however, he's less of a lock to play every down and therefore carries more risk. 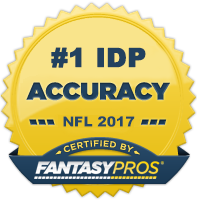 He's worth a speculative add in deep leagues and is someone who should be closely monitored in Week 10 in balanced and shallow leagues. LB Nigel Bradham (PHI) - After seven games, it's become clear that Bradham is the linebacker to own in Philadelphia over Jordan Hicks as he's out tackled him in every game except for one. The Giants are a middle of the road matchup for linebackers but the game is in New York so Bradham will get the benefit of the league's most generous stat crew. He has a fairly high floor for a player barely owned in leagues and will have 8-10 tackle upside this week. LB Korey Toomer (SD) - With Jatavis Brown shelved for a couple of weeks with a knee injury and Denzel Perryman working his way through multiple injuries, the Chargers could very well be forced to go to Toomer as their every down linebacker this week against the Titans. The Chargers funnel ballcarriers to their linebackers so Toomer could be a nice short-term pickup if he gets the starting nod. Rookie Josh Perry is another player to watch if Perryman is out. If Perryman plays, he would be the top option as a pickup. We should have more clarity on the situation middle to later this week, but it's a situation to keep an eye on for fantasy purposes. S Bradley McDougald (TB) - McDougald has compiled four straight weeks of solid fantasy production (8-0, 6-2, 6-1 INT, 8-0) and has a slightly above average matchup in the Falcons this week. He should be rostered in almost all leagues - he's a top 20 DB this week and for the rest of the season. S Robert Blanton (BUF) - Blanton is taking over for an injured Aaron Williams at safety for the Bills and he produced with 11 total tackles against the Patriots. With Preston and Zach Brown at linebacker in front of him, there is going to be variance in his week-to-week numbers. But he has enough tackle upside to be strongly considered as a DB3 in 12-team leagues. S Daniel Sorensen (KC) - Sorensen remains a part-time player for the Chiefs as their third safety, but his production has grown in each of the last three weeks (5-1, 6-0-1, 7-0 FF). I would expect the Chiefs to keep giving him more playing time as he has been one of their better play makers. There's obvious risk going with a guy that is likely only to receive 65-75% of the snaps, but he may be worth the dice roll in deeper leagues as a bye week cover.